July 4th 2004 was the centenary birthday of George "Shorty" Snowden, one of the most influential dance figures in US popular culture, yet one of the most unknown. Primarily responsible for the creation of the Lindy Hop, better known in the UK as the original form of "the jive," his precise role in this respect and how it links to his widespread dance legacy has so far escaped serious consideration. Hundreds of thousands of people dance the Lindy Hop's descendent forms today, ranging from the baroque mannerisms of competition "ballroom jive" and the ultra laid back US West Coast Swing style to the gymnastically pretentious European Acrobatic Rock 'n' Roll or the now barely recognised, but actual, Lindy Hop legacy embedded in Mambo and Salsa. It is unlikely however that more than a few of these practitioners could detail where it all began. Even those who identified Snowden as the key innovator would still be hard pressed to name his partner, which is extraordinary considering the importance still attached to apposite "partnering" in the derivative forms of the Lindy. UK discussions concerning the origins of the dance rarely venture beyond vague accounts of American GI's bringing the "jitterbug" to the UK during World War Two and news reports of 1950's "rioting" teenagers dancing in the cinema aisles when the Billy Haley films introduced the dance to a new generation. Apart from their limited grasp of the Lindy tradition, such viewpoints are indicative of the way the dance is often isolated from wider artistic movements or significance. Even in competition ballroom dance, "the jive" that more accurately is called ballroom jive occupies a solitary position as the only "American" example in the Latin and American category. Yet its 1928 moment of inception was part of a critical surge of American dance creativity in which rhythm tap, contemporary and other forms made striking "modern" developments. Attuned to the urban and industrialized rhythms of twentieth century living they liberated themselves from the exotica of the past by concentrating on enhanced technically expressive movements. At the beginning of July 1928, Snowden and his first partner, Mattie Purnell, were several days into a Harlem dance marathon at the Rockland Palace ballroom. Experimenting with current dances ranging from the Collegiate, a kind of Charleston partner dance, to the Lindbergh Hop, that reputedly consisted of a specific Charleston type step, Snowden at one point lost his grip on Purnell's hand. She spun away but he reached out and pulled her back whilst masking the "mistake" with a couple of fancy steps. The audience roared with approval, so they did it again, but deliberately and without letting go thus unleashing a range of new fluid and expressive movements to four-beat sequences. Hitherto prevailing two-beat "Ragtime" and "Jazz" steps were rephrased in line with the parallel developments in jazz music that were similarly experimenting with lengthened time signatures. Following the marathon, Snowden and Purnell apparently were considering calling their dance innovation Walk That Broad. By September though Snowden had rechristened it The Lindy Hop when appearing in Harlem's Lincoln Theatre, with a new partner, Pauline Morse. Two months later, Snowden had his own dance company on stage, three couples of which appeared in the short film "After Seben." It seems that differences over technique saw the replacement of that group with a new line up by the beginning of 1930. It featured a fresh talent on the scene George "Twistmouth" Gannaway, who introduced early versions of air steps into the dance. The inclusion of another New Jersey couple later that year led to the company appearing in the Broadway production "Singing the Blues" in 1931, of which one reviewer commended "….the wildly torso-tossing dancing couples in the dive scene." That group too fell apart in the following year and Snowden began dancing with his best known partner Big Bea, in two Bill Robinson touring productions. According to Mura Dehn, who arrived on the scene in 1930, Big Bea who was "…. twice his size, would throw him up in the air, down on the floor, pick him up and throw him down again, whilst Shorty, seemingly unaware, would struggle to complete his steps, fidgeting in her arms in the air." Previous dance fashions came from Europe or were typically traceable to the northward African-American migrations of the turn of the century. The Castle Walk for example emerged from the One Step that itself was only a "cleaned up" version of the Turkey Trot that had been soundly condemned by the Pope. Snowden's New York heritage, from his mother's side of the family was indelibly marked on this first "big American city" popular dance. As a partner dance the Lindy was consciously "modern" and "historical" in that its drive for enhanced technical expression led to its encyclopedic referencing to past and contemporary dance forms. In this respect the Lindy became the culmination of two major traditions- the African-American dances that redefined the perception of the black body in the face of racial disparagement, and the European ballroom tradition that had re-defined society as "modern" nuclear couples rather than complex patterns of intricate kinship groups as in the pre-Waltz forms. Snowden's mother, Mary, whose hard-hitting right hand Snowden remembered even when interviewed in the 1950's, was the dominant figure in the family. 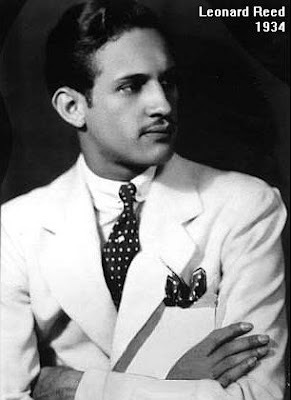 Born in lower Manhattan, they moved to Harlem by 1910, by which time it appeared his father had left home. 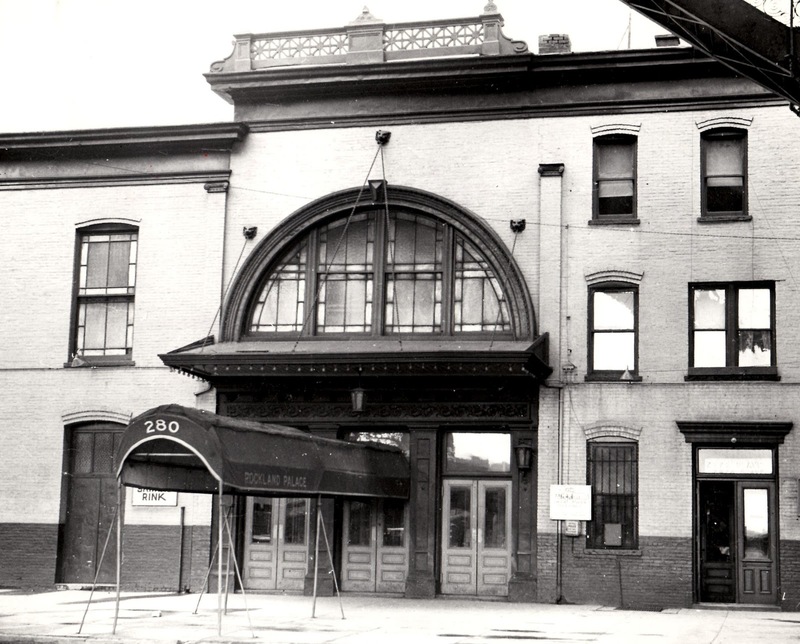 In trying to reconcile his mother's strict Episcopalian expectations with the exuberant, and not always legal, aspirations of his friends on 135th Street, George Snowden's early days were not always easy. Before 1920 he was told he could never dance again after breaking both ankles ice-skating, and by 1920 he was an inmate in "reform school". Street life in Harlem however could have a positive side. Contrary to the lurid accounts in the Stearns' book Jazz Dance, joining the local Jolly Fellows social club apparently constructively re-focused his energies. He became a shipping clerk and, overcoming his former injuries, one of the fastest Charleston dancers in the locality. Snowden and Purnell, "couple no. 7" in the marathon where they took the first Lindy steps, were encouraged throughout by the support of The Jolly Fellows, who they represented. Snowden became an unequalled Lindy maestro in its basic social, competitive and performance modes. He exploited the unique character of this dance that makes it as riveting to watch in social dance settings as on stage when danced well. Dehn asserted Snowden's " …. routines became Savoy classics; his spur of the moment innovations seemed inexhaustible. This little man held sway over the roughest crowds, commanding the respect and attention due a master." At the centre of this new dance excitement Snowden won "national" Lindy Hop championships, with different partners, at the Roseland Ballroom in 1930 and the Savoy Ballroom in 1931. The ballet world seemed especially entranced. Whilst sitting in the London Savoy, Diaghilev informed Harold Acton that the Harlem Savoy's music and dance was "immeasurably superior." 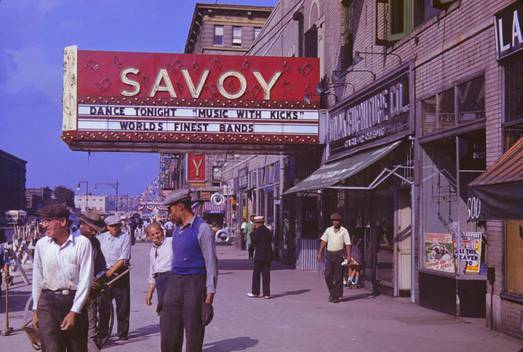 Acton later observed how the Savoy dancers "…. bodies emitted bright hot rays of rhythm. Every limb was brought into play, supple, sensitive and controlled." Despite his impact Snowden remained at odds with the Savoy management. Quite apart from disliking the street dances of the day, the manager Charles Buchanan - who claimed to have devised the title "Lindbergh Hop" in a derogatory sense - was no doubt dubious about Snowden's social background. The ballroom continued not acknowledging the Lindy Hop, despite a reconciliatory gesture to Snowden after refusing him Savoy endorsement for the marathon, and the growing although largely unreported popularity of the dance there. The Lindy Hop could not be stopped though, and when the Paul Whiteman Orchestra, recruited Snowden's dancers in 1932 they took the dance to many different parts of the USA. Swing was becoming big business. To forestall other ownership claims for the Lindy, the Savoy Management eventually engaged in surreptitious myth construction to tie the dance to the ballroom. Contemporary press reports of the 1928 marathon had described Snowden's innovation as a departure from the Lindbergh Hop, that actually did reference the first solo flight across the Atlantic. 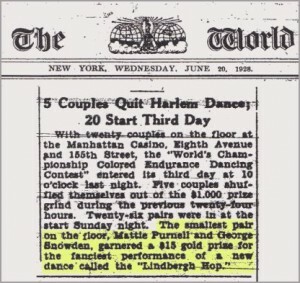 Picking up on popular mythology that confused the later Lindy Hop with Lindbergh, the inception of the dance was now merged with cross Atlantic flight in the new versions. Albeit six years after the event, Snowden began "generously" attributing the inspiration for his innovative marathon step to Charles Lindbergh, presumably not to be excluded from the new story about how the Lindy was created. Exclusion was actually on the cards. 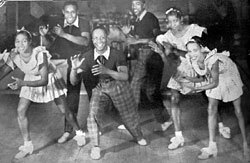 At this time as his former mentor, Herbert "Whitey" White, founder and President of The Jolly Fellows and a Savoy bouncer, began recruiting a new generation of Lindy Hoppers for a dance company that would be more compliant with the Savoy's needs. Eventually Snowden's group relocated to Small's Paradise Club on Seventh Avenue. There is little evidence though to support the Stearns contention of a major clash between 'old' and "new' generations over "air steps" that Leon James is cited for in Jazz Dance. It's possible that Stearns misunderstood a late 1950's dismissive comment by Snowden about current lindy/jitterbug dancing being all acrobatics with insufficient grounding in floor steps. Snowden's group however held their own. In 1935 Shorty and Big Bea appeared in an Eddie Cantor film and in the following year The Amsterdam News was still describing Snowden as "King of the Savoy." In 1937 they were a major success in the Cotton Club under the direction of Leonard Reed. Everyone danced "The Shorty George" step that Snowden innovated, the only Lindy Hopper in fact to have a step named after him. The Count Basie number "The Shorty George" though was not named after Snowden. "Shorty George" was a popular mythical figure in African-American folk law as the early 1920's blues number of the same name testifies. It's possible that Count Basie Orchestra 1938 recording however, was a measure of recognition for Snowden who retired from professional dancing on doctor's orders that year, as indicated the following year by Erskine Hawkins Orchestra's recording of "Saboo," (an alternative name for the "Shorty George" step). Fred Astaire possibly confused this issue in a 1942 film by dancing and singing about the Shorty George, whereas Frank Sinatra sang only about the mythical "Shorty George." The step was also a favorite of the Andrews Sisters, who can be seen dancing it in the film "Buck Privates." Snowden concluded his dancing career as modestly as it began. Regulars, such as Eva Zirker one the of the few "white" members of the Savoy's 400 Club recall his quietly insistent tale of how he created the Lindy that suggested a concern with historical accuracy rather than self promotion. He opened a dance studio for a while in Harlem, but increasingly spent time in Queens dancing socially in venues like "Big George's" club in Corona, where he continued to be in great demand as a partner. He spoke warmly of other dancers, white ones included, especially Paul Draper who influenced him a lot and the lindy hopping Harry Rosenberg, thus sustaining the Swing ethos of integration. When the Lindy, in the guise of "Rock 'n' Roll Jitterbug-Jive" made a third comeback in the 1950's, the purist in him seemed offended by the unskilled enthusiasm of many of the newer dancers. Meanwhile he cared for an invalid wife in his later years, but still went dancing with Little Bea whenever he could. Snowden died in Far Rockaway, Queens in May 1982 as an inevitable new generation of enthusiasts emerged. Although numerically few when compared with previous "renewals" they were determined to rescue the original form from its subsequent descendants. Like other major turning points in the history of the Lindy, this new interest seems to have been part of a wider dance upheaval such as the contemporary revival of Argentinean Tango. The international character of this 1980's interest was replaced by a specifically US, but even larger, mid 1990's surge of interest. The latter put the Lindy back into Hollywood films, on the Broadway stage and in many other performance contexts alongside a major renewal in social dancing, but Snowden's name was mentioned briefly at best. Of all the twentieth century American seminal dance figures (Balanchine for American ballet, Isadora Duncan in Modern, Jack Cole for Jazz Show Dance, Bill Robinson for Rhythm Tap Dance etc.) Snowden remains the least known. Fortunately the stubborn persistence of the Lindy tradition suggests that not only will it survive long enough to be taken seriously, in the way that George Snowden would have wished for, but that his diverse legacy will finally be adequately acknowledged. Hovering in the background also is the still unresolved issue of whether an acrobatic Lindy derived dance will be accepted for the 2012 Olympics, a move that Snowden undoubtedly would not have approved. Note: The critical points made in the article of Marshall and Jean Stearns book Jazz Dance, are only intended as minor corrections to an invaluable book that anyone interested in this subject should read. Could you possibly provide a source(s) for folk usage of the term "shorty"? Digging through contemporary references to the term is is a bit daunting. I know of 3 uses of the term Shorty George, one was a dancer as mentioned here, one was a nick name for a train in Texas that took people to the penitentiary, the third was a mythological person who is sleeping with your wife while your away at work or in jail.